This is the official emblem of the Apollo 17 lunar landing misison which will be flown by Astronauts Eugene A. Cernan, Ronald E. Evans and Harrison H. Schmitt. The insignia is dominated by the image of Apollo, the Greek sun god. Suspended in space behind the head of Apollo is an American eagle of contemporary design, the red bars of the eagle's wing represent the bars in the U.S. flag; the three white stars symbolize the three astronaut crewmen. The background is deep blue space and within it are the Moon, the planet Saturn and a spiral galaxy or nebula. The Moon is partially overlaid by the eagle's wing suggesting that this is a celestial body that man has visited and in that sense conquered. The thrust of the eagle and the gaze of Apollo to the right and toward Saturn and the galaxy is meant to imply that man's goals in space will someday include the planets and perhaps the stars. The colors of the emblem are red, white and blue, the colors of our flag; with the addition of gold, to symbolize the golden age of space flight that will begin with this Apollo 17 lunar landing. 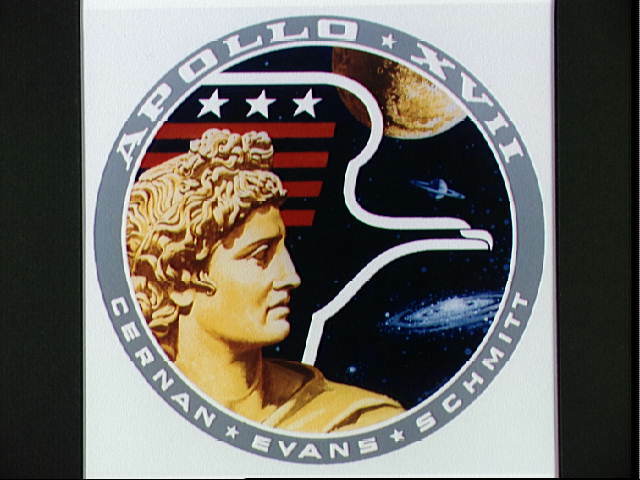 The Apollo image used in this emblem was the Apollo of Belvedere sculpture now in the Vatican Gallery in Rome. This emblem was designed by artist Robert T. McCall in collaboration with the astronauts.